The Cyprus Bird Report 2013 is now available. The report contains 37 colour photos, the 2013 Systematic List of 293 observed species or recognised forms which was compiled from nearly 65,000 records, the 2013 Ringing report, papers on the first Asian Buff-bellied Pipit in Cyprus, the Southern Grey Shrike species complex, the BirdLife Cyprus 2013 monitoring programmes and Cyprus ringing recoveries updated to 2013. The Report includes species charts and tables and a full Cyprus bird List. 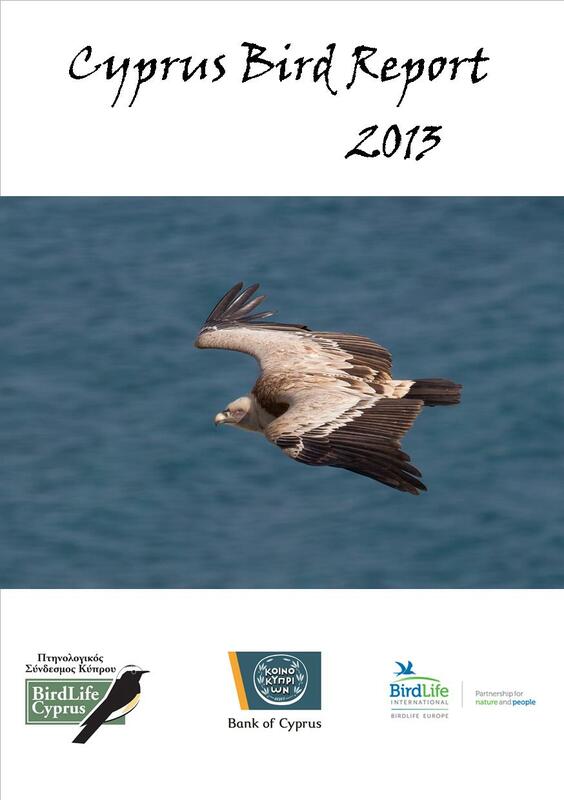 The front cover features the Eurasian Griffon Vulture, the subject of a reintroduction project -GYPAS.